One of the better parts of covering the New York Ranger and New York Islander prospects is that the playoff season starts early and ends later. It is the last Friday of the Canadian Junior season and the 1st or 2nd weekend of college playoffs for every NCAA league but 1. In other words just about every game had some kind of meaning to it to make it worthwhile. Normally when a 7th seed is playing a 1st seed then not so many people will give that team a chance to win a playoff series. 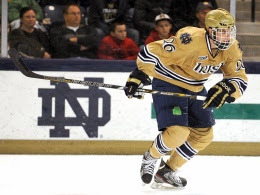 But Steven Fogarty (NYR 2011 3rd) and his 11th ranked Notre Dame Fighting Irish are not just any 7th seed as top seeded and number 2 Boston College found out the hard way. In game 1 of the Hockey East quarterfinals, it was Fogarty's Fighting Irish putting a 7-2 whipping on Boston College on their home ice. Fogarty had 2 primary assists in the win as the Fighting Irish defeated Boston College for the 2nd time in the last 2 weeks. Fogarty earned his assists on Notre Dame's 4th and 7th goals of the game but it was the assist on the 4th goal that took the sail out of Boston College. With Notre Dame up 3-1, Fogarty set up Peter Schneider for an even strength goal just 1:08 into the 3rd period. That 4-1 lead was the start of 4 third period goals as Notre Dame blew the game open to grab a 1-0 series lead. For Fogarty, the assists were his 6th and 7th of the season to bring his season totals to 3-7-10. The win may not guarantee a series win but it gives Notre Dame a huge "quality" win which could come in very handy when it comes to invites to the NCAA Tournament. Quality Win Bonus (QWB): A "Quality Win Bonus" was added for the 2013-14 season. For any win against the top 20 of the RPI, a team is awarded "bonus points" on a sliding scale from 1-20. In other words, a team is given a .050 RPI bonus for defeating the No. 1 team, sliding down to .0025 bonus for defeating the 20th team. The total bonus for the season is divided by the amount of games played (weighted for home-road), to give a final bonus figure. There was previously a more vague bonus system, which applied to wins against non-league teams in the Top 15 of RPI. That lasted from 2004-08 before being eliminated. Notre Dame has defeated the teams ranked number 1 twice (Boston College, Minnesota) and ranked 2nd once (Boston College) to give them a QWB of 0.0068 which is 4th best in the NCAAs. Game 2 is Saturday evening at Boston College. Brady Skjei (NYR 2012 1st) recorded his 4th goal of the season as his top ranked Minnesota Golden Gophers because the first regular season champions of the Big Ten Conference after a 3-2 overtime win over Cristoval Nieves (NYR 2012 2nd) and his 13th ranked Michigan Wolverines. Skjei got Minnesota on the board first when he grabbed the puck off the board, threw it down to his stick and fired a shot from just inside the blueline that Michigan goalie Zach Nagelvoort either never saw or was just too slow reacting to it. It was an ugly duckling of a shot but it went in and that it is what matters most. For Skjei, he is now 4-5-9 on the season as his teammates Taylor Cammarata (NYI 2013 3rd) and Jake Bischoff (NYI 2012 6th) were both scoreless. As for Nieves, just when you think he is going to get going he doesn't as the 3rd line center came up empty for Michigan again. The same two teams will meet again on Saturday in a game televised by the Big Ten Network starting at 7PM EDT. Ryan Pulock (NYI 2013 1st) may have saved the Brandon Wheat King's season when he set up Eric Roy for a power play goal at 2:18 of overtime to give the Wheat Kings a 4-3 win over the Regina Pats. It was Pulock's 38th assist of the season and 60th point as the Wheat Kings jumped from 9th to 7th in the WHL's Eastern Conference standings with just 1 game left in the regular season. If Brandon gets at least 1 point in their game on Saturday night which will also be against the Pats, it will clinch a playoff spot. Regina was missing their captain Kyle Burroughs (NYI 2013 7th) for the 3rd straight game as he is out with an upper body injury. Regina with the one point they got clinched the WHL's East Division and the 2nd seed in the WHL's Eastern Conference. The Pats could wind up playing the Wheat Kings in the 1st round of the WHL playoffs. Ryan Graves (NYR 2013 4th) had an assist to go along with a +3 and a hit as his Val-d'Or Foreurs defeated the Blainville-Boisbriand Armada 6-1 to clinch the QMJHL's Telus West Division and the 3rd seed in the QMJHL playoffs. It was the 4th straight win for the Foreurs and for Graves, his assist was his 17th of the season and the 22nd point. Loic Leduc (NYI 2012 4th) and his Rimouski Oceanic defeated the Quebec Remparts 4-3 in overtime for their 16th straight win. Leduc had the primary assist on Rimouski's first goal of the game for his 9th assist and 15th point of the season. The win keeps the Oceanic in virtual tie with Baie-Comeau Drakkar for the QMJHL Telus East Division and the number one overall seed in the QMJHL playoffs (the Drakkar hold the tiebreaker with 1 more win). As for the Remparts who were still missing Anthony Duclair (NYR 2013 3rd), they have dropped to 7th in the QMJHL standings and if they don't find a way to earn a couple of points against Rimouski on Saturday could fall down to 8th. Adam Tambellini (NYR 2013 3rd) had 2 primary assists as his Calgary Hitmen defeated Mackenzie Skapski (NYR 2013 6th) and his Kootenay Ice 4-3 in the shootout. Tambellini recorded the primary assists on Calgary's 1st and 3rd goals of the game helping chase Skapski from the net in the process. Tambellini did miss on his shootout attempt but improves to 17-21-28 in just 30 games with the Hitmen, a very impressive stat for the young center to have. As for Skapski, he lasted just 28:46 giving up 3 goals on 16 shots. His Ice came back to tie the game and force first overtime then the shootout but somehow Skapski got charged with the shootout loss which is wrong. Kootenay and Calgary will face each other on Saturday with Kootenay trying to hold on to 5th place in the WHL's Eastern Conference while Calgary needs a win but 2 Edmonton losses to earn the top seen in the same conference. Don't think it will happen. Adam Pelech (NYI 2012 3rd) had 2 assists and was a +3 while teammate Troy Donnay (NYR 2013 UFA) had 1 assist and was a +1 with 9 PIMs as their Erie Otters just trashed Victor Crus Rydberg's (NYI 2013 5th) Plymouth Whalers 10-1. It was an ugly game as the Otters tied a franchise record for most points in a season with 104. Troy Donnay actually winds up with setting up the game winning goal as he had the primary assist on Michael Curtis's goal which came at 16:17 of the first period breaking a 1-1 tie. It was Donnay's 16th assist and 18th overall point for the 6'7 defender. Adam Pelech had both a primary and a secondary assist as his points came when the game was blown open. The secondary assist came on Erie's 5th goal while the primary came on the final goal of the game. For Pelech the 2 assists improve his numbers to 9-45-54. Jesse Graham (NYI 2012 6th) and his Saginaw Spirit took to the ice for the first time since learning of their teammate Terry Trafford's death. They were in Sault Ste. Marie to face the Greyhounds and the Greyhound team and fans honored Trafford with a pregame ceremony that was quite emotional. As for the game, Saginaw lost 6-5 after falling behind 3-0 in the first period. Graham was scoreless as the Spirit are trying to hold on to 6th place in the OHL's Western Conference with 2 games left in their regular season. They play London Saturday at home in what is expected to be a very emotional game for the Spirit. Services for Terry Trafford will be held Tuesday in his hometown of Toronto. Eamon McAdam (NYR 2013 3rd) of Penn State and Stephon Williams (NYI 2013 4th) of Minnesota State were both "DNP" for their respective teams. ADD Nick Latta to your Hartford Wolfpack Lineup. Nick Latta of the Sarnia Sting is expected to join the Hartford Wolfpack on an ATO (Amateur Tryout) once his season with the Sting ends this weekend. Latta is a 20 year old 6'1 194 lb center who shoots right and is coming off a career season with the Sting with a 36-28-64 mark. Latta is a native of Germany and it will be interesting to see how he handles the jump to the AHL. I don't expect to see him have a major impact but the Rangers need to rebuild their prospect pool.